There are futuristic-looking cars, then there are cars that are actually futuristic. The 2016 Toyota Mirai is definitely one of the latter, soon to take its place in history as the first car to bring hydrogen fuel-cell technology to the masses — something you can buy, keep and pass on to your kids when you get old, who by then, will laugh at the idea that at one point, someone thought it was futuristic. But for now, the Mirai is the future — literally: the name means “future” in Japanese — and Toyota hopes that it will follow in the treads of the successful Prius (whose name means “predecessor” in Latin, incidentally). And this so-called future will become the present starting in the third quarter of 2015. Still, the Mirai has a face only an aerodynamicist could love. A clone of the FCV Concept that Toyota trotted around to auto shows in 2013, the Mirai is roughly the same size as the Camry Hybrid, with 2.5 inches more height and an aerodynamic underbody that’s an inch closer to the ground. Like the FCV Concept, the Mirai has gaping triangular outboard air intakes, vertical turn signals, “floating” hood and roof panels and four menacing-looking LED headlamps on each side. For the record, Ogiso has an explanation for the styling: “The sides of the car are meant to convey the transformation of air into water, with flowing door profiles. The rear uses a catamaran shape representing water flowing under and through the body.” Oxygen in, water out: not unlike how fuel cells work. And apparently the Mirai needs a lot of oxygen. All Mirais are monospec and include Toyota’s latest and greatest EnTune system, navigation, and a hydrogen station locator app. Packaging for the various fuel cell and hydrogen storage components limit the size of the trunk, and the need to keep gross vehicle weight down dictated a fixed center armrest between the two rear seats, limiting total passenger count to four. The Mirai’s only option is a so-called “Power Takeoff” system, which essentially is a DC outlet in the trunk from which up to 60 kWh of power can be drawn off the fuel cell to power to one’s home in case of a outage or emergency. That’s enough to power an average household for five or six days, according to Toyota. The star of this show, of course, is the Mirai’s fuel cell powertrain itself, which represents a quantum leap in mass reduction and power output over the powerplant used in the Highlander-based FCHV pilot vehicles in service since 2008. Mounted beneath the front seats and weighing just 123 pounds, the unit contains 370 cells. Output density rises to 3.1 kW per liter (or 2.0 kW per kilogram measured by mass) while requiring far less of a pricey platinum catalyst. 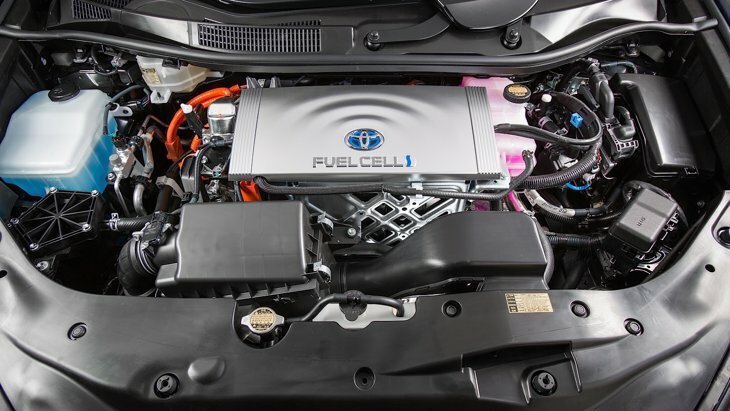 With the help of a boost converter, the fuel cell is compatible with Toyota’s hybrid synergy drive system, so the Mirai’s front wheels use the same AC synchronous electric motor with 151 hp and 247 lb-ft of torque found in certain Lexus hybrids, and the nickel-metal hydride battery pack from the Prius. A maximum of 5.0 kilograms of compressed hydrogen can be stuffed into the Mirai’s two 10,000-psi carbon fiber-reinforced tanks, one of which is situated under the rear seats and the other one tucked between the rear wheels. Fill them to the brim, and range tops out somewhere around 300 miles, says Toyota, a figure that could be even greater if Toyota wanted to add another tank. But doing so would add more weight, and with its porky 4,079 pounds — 594 pounds more than a Camry Hybrid — the Mirai needs no more mass. As it stands, Toyota says the Mirai can hit 60 mph in nine seconds flat, and eventually tops out at 111 mph. Oh, and refueling should take about five minutes at a 750-bar refueling pump, not much more time than it takes to gas up a normal car. The MSRP for the 2016 Mirai has been set at $57,500, but up to $13,000 in federal and California state tax incentives could potentially drop the price below $45,000. Toyota expects that only 10 percent of buyers will opt to actually buy the Mirai, with the other 90 percent likely to choose Toyota’s $499/month lease (with $3649 due at signing), which includes 24-hour fuel cell-savvy concierge service, roadside assistance, three years of complimentary maintenance and free fuel. Those who opt to own the Mirai will also get eight years/100,000 miles of warranty coverage for fuel cell components. Only 700 Mirais will be imported in its first year, scaling up to a still-modest 3,000 by the end of 2017. Sales will be limited to certain regions in California, where a fledgling hydrogen infrastructure is slowly but steadily growing, and possibly some states in the Northeast as itsinfrastructure develops. (More on that in future posts.) Toyota is coy about predicting what will happen after 2017; by then, the Mirai will have much more competition, dozens more stations will come online, and the hydrogen fuel suppliers will also have established pricing policies, which, based on experts we talked to, are expected to be about $10/kg, or about $50 per fill-up. Several automakers have tried to lease hydrogen fuel cell vehicles in limited numbers, with limited effect, due to the chicken-and-egg problem of filling stations. If the Mirai breaks that logjam, Toyota could once again, as it did with the Prius, rule the roost.